My essay is about role-playing like you’re starring in your own television show. It had two parts. First, I wanted to have a section where I addressed thematic issues about this style of game. Second, I took the Cortex Classic character sheet and modified its contents to put more emphasis on roles and relationships. Combined, the essay will likely be more helpful for newer Cortex Plus fans who have roots in Classic than those who’ve played through this system since the very beginning. Enjoy the book! There’s a lot of great material here! Then, there is Edgar. My cherry tomato. Oh, how the mighty have risen and fallen. 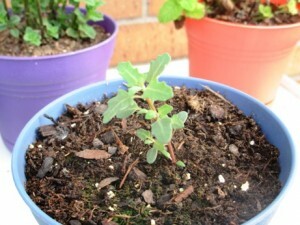 This little sprout rose from the ashes of an entire dead pot of italian oregano. I’m worried about my brains and what’ll happen as it continues to grow. 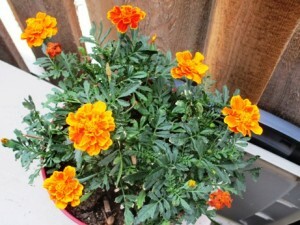 Marigolds are amazing natural pest repellants. Or so I hear. 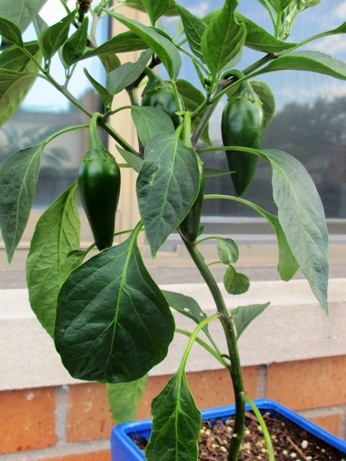 Then there are the jalapenos. Doing well. As they do in this type of weather. 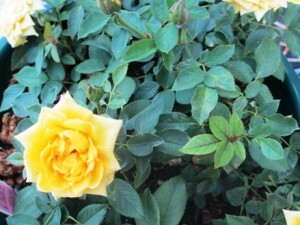 I have bebeh roses, too. These were mostly dead when I got them, but they’ve been revived due to plant vitamins. They attract the bees. 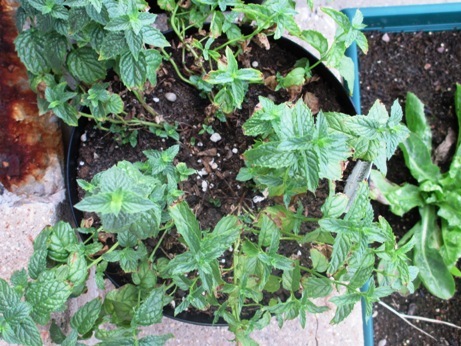 Spearmint, peppermint, lavender, and lemon balm are some of the other herbs I have planted. (I should learn how to dry them, eh?) The lavender, if it blooms, won’t until the fall. But, the peppermint is growing mighty nice. 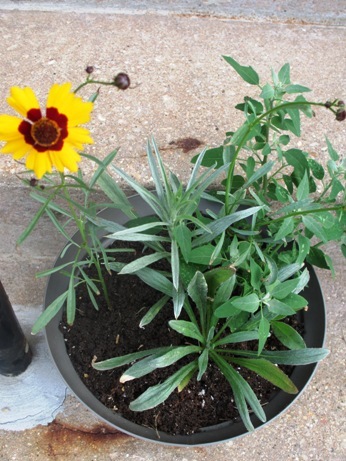 Still have to replant the other one. Mood: At one with the world. Work-Out Minutes Logged Yesterday: Shooooooooooooot. In My Ears: Residual background noise. Game Last Played: *coughs* Candy Crush. Still. Crap. As the brand manager/lead writer for the Firefly RPG, there is nothing that makes me feel happier than being able to make good on a promise. We said we were going to offer the Wedding Planners Cortex Classic Set in July, ahead of the Gaming In The ‘Verse: GenCon 2013 Exclusive, and? It’s hard for me to imagine how much time has passed since my company first started in 2005. I remember standing at GenCon with stacks of freshly-printed books talking to hundreds of gamers about the movie Serenity and, of course, Firefly. It’s no secret I’m a big fan of the ‘Verse and have loved the series since it first debuted. I know many of you feel the same way, too. That’s why I am thrilled to present the first Echoes of War adventure for the FIREFLY RPG. But, more than that, I’m excited that we’re offering my adventure in two systems for our fans: Cortex Classic and Cortex Plus. This edition of Wedding Planners uses the Cortex Classic stats from our original game system and complements the Serenity Crew in Cortex Classic and the CORTEX CLASSIC SYSTEM ROLE PLAYING GAME included with this release. We are offering this option to fans of our original game mechanics as a way of saying “Thank You!” for being such an important part of my company. We have not forgotten about you! The Cortex Plus version, which will employ our shiny new FIREFLY RPG game mechanics, will be released separately and will be clearly marked as such. Regardless of what system you love, I hope you have fun with Wedding Planners and are excited as I am to play in the ‘Verse! The above text is republished from a letter that appears in the Wedding Planners Cortex Classic adventure. A PDF version of this letter is available here. This song is “Nothing to Prove” by the Doubleclicks and shows a few, familiar faces with a message about “fake geek girls.” Here’s the thing: if you want to know what Speak Out With Your Geek Out was all about, this was it. If you watch the video, there are cultural aspects to comments made. It’s not “just” about Superman versus Batman or who likes what more. Getting negative comments isn’t about “you” persay, but how you “fit” into a stereotype that other people use to define you based on their definition of who you should be. Quite frankly, that’s total nonsense. 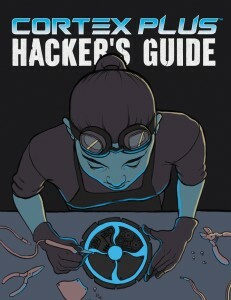 Let your geek flag fly! After all, isn’t the entire point of geekdom to have fun doing what you love? Work-Out Minutes Logged Yesterday: There was fresh air. I think I coughed. In My Ears: White noise, courtesy of my fans. Not the real ones, the electric kind. Game Last Played: *coughs* Candy Crush. Otherwise known as the time-sucker. Have to stop now. 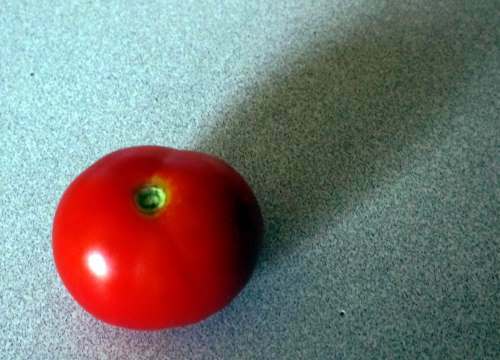 Yes, this is a picture of a tomato. But not just ANY tomato. My first one! Er… Well, it’s the only one right now. I have four varieties of tomatoes growing. Truth be told, I can’t stand them fresh. Mash ’em up into salsas and sauces just fine, but eating them raw and wriggling? Not a fan. I could be convinced to eat them in a BLT, though! But yes, right now this is the lone tomato. It is solitary. It is red. It is the singular fruit of my labor. I also have to figure out what to do with lemon balm. 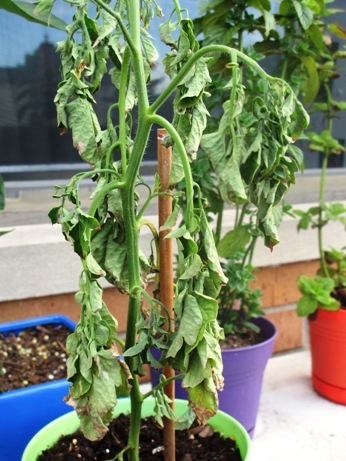 My oregano died a thousand deaths, but it’s now a zombie oregano. There is a little bit that’s coming back. Both mints are doing quite well and so are, much to my surprise, my mini rosebush. Um, don’t ask me about the carrots. That’s just embarrassing. Mood: It’s hot and I’m on deadline. Ergo, I’m whiny. Caffeinated Beverages Consumed: Sweet, sweet legalized drug. Work-Out Minutes Logged Yesterday: I’m ashamed to admit there was none. Game Last Played: *coughs* Candy Crush. Otherwise known as the time-sucker.